SVKM’s Mithibai College in collaboration with Kaivalyadhama Yoga Institute organised a workshop on 20th January 2018 from 10:00 am to 12:30 pm at Bhaidas Hall, Vile Parle (W) to help students beat examination stress through yoga. The event was inaugurated by Shri. Dr. Vipin Sharma (I.A.S), Commissioner (Education) Maharashtra State and Shri. 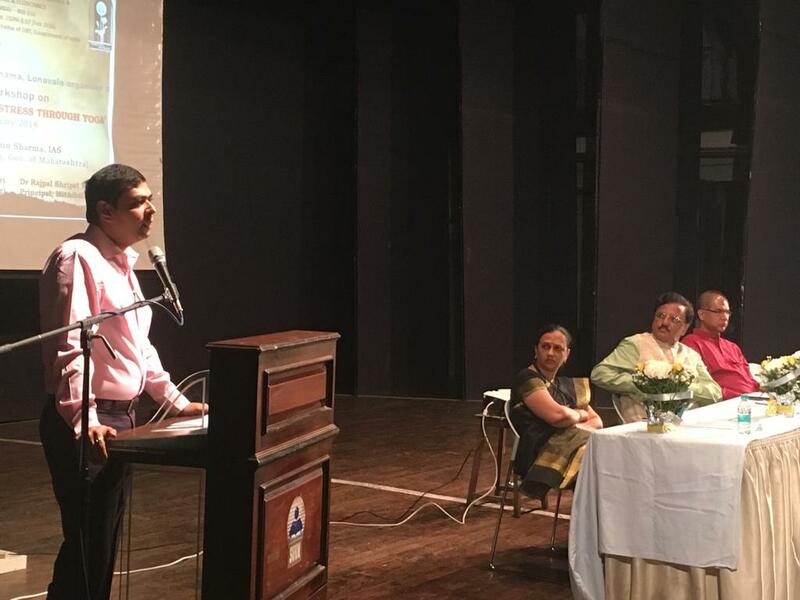 Subodh Tiwari, CEO Kaivalyadham Yoga Institute was the keynote speaker. These resource persons tried to familiarize the students of Class 11 and 12 with the stimulating basics of Yoga. Around 1000 student participants from across the various streams attended the workshop. Members of college managing committee and Principal Dr. Rajpal Shripat Hande welcomed the guests and appreciated the resource persons for inspiring the young students. The students were introduced to basics of breathing and stretching asanas to help relieve stress. The students enthusiastically participated and were engaged throughout the workshop. “It was a useful session and I’m feeling good that my college is taking effort for us students” said Shreya Dhole, FYJC Science student. “I’m glad I attended this session especially for the neck exercises” said Devanshi, SYJC Arts student. “Students should try to take ten minutes for themselves and ensure to eat well, exercise and stay calm” said Shri Subodh Tiwari, CEO Kaivalyadham Yoga Institute. “The young generation especially adolescent students in schools and Jr.college are under stress with so many things. Examination stress affects their performance which ultimately affects results. This workshop was arranged to equip students to handle stress. It is a grand success with around thousand plus students participating. Experts from Kaivalydham Institute have demonstrated various techniques which if followed will benefit the students not just for their results but overall well-being.” said Dr. Rajpal Shripat Hande, Principal, Mithibai College.